A: Yes! 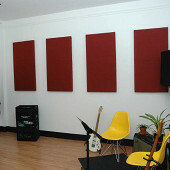 ATS Acoustic Panels are Made in the USA, but we offer hassle-free shipping to Canada. Q: How do I place an order shipping to Canada? A: Click the Canadian flag button in the top-right corner of your screen, then browse our web site and add the items you want to your shopping cart, checkout, and you'll all set. Q: What about duties and taxes? A: We ship to Canada as a non-resident importer, so all duties and taxes are handled by us. GST/HST will be added to your order during checkout. We collect QST on orders shipping to Quebec. The recipient may be responsible for PST on orders shipping to other provinces, where applicable. Q: What is the lead time for orders to Canada? You should receive your items 1 to 2 weeks after placing your order.